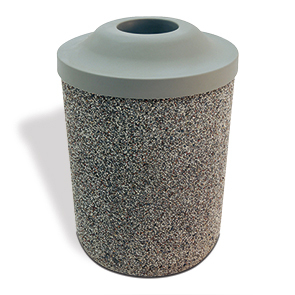 Keep facilities safe, clean and professional with a concrete receptacle. This 31 gallon round trash receptacle is capable of withstanding the harshest of climate conditions due to its highly durable, stable reinforced concrete construction. The lid provides 360 degree of pitch-in disposal access with a generous opening that ensures tossed waste makes it into the receptacle. The rounded convex shape of the pitch-in lid conceals the contents and discourages the placement of litter on top of the receptacle. Wiped clean with simple soap and water, the highly durable polyethylene pitch-in lid will not fade, stain, rust or corrode. The stable concrete design with any choice of standard or premium finishes help keep properties looking good for many years.